Look closely at the images reprinted below. 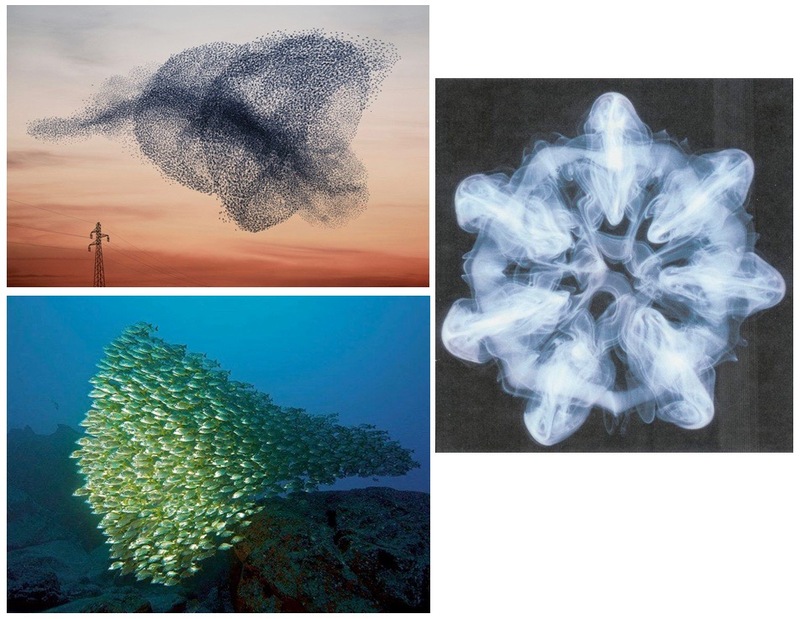 What do the murmuration of starlings, the smoke ring, and the school of fish have in common? In the photos above, we see two dimensions, or trajectories, simultaneously. Many individual fish populate a singular school of fish; individual birds flock together; and myriad specks of ash cluster into an intricate smoke ring. Everything is at once singled out, as a whole in itself, and mingled in, as a part of a larger whole. Each photo depicts a grouping of Parts that are somehow Participating in a larger body. How? The formations are leaderless, and the individuals in the collectives make no conscious choices about where they belong or how they function within the complex, dynamical organizations. Arthur Koestler, 20th century writer, coined the phrase ‘holon’. The suffix on means particle, as in photon, electron, pi meson, etc. Hol is the common root of the words whole and holy. The term ‘holon‘ refers to how a Part of something is also a whole, or Particularity unto itself; and furthermore, the Particularity Participates as a Part in a greater whole. A hierarchy of holons is what Koestler called a ‘holarchy‘. 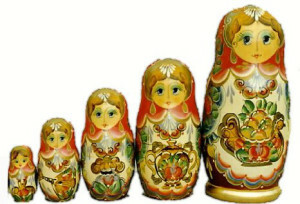 This may bring to mind Matryoshka dolls, stacked in layers, one outside the other, on and on. 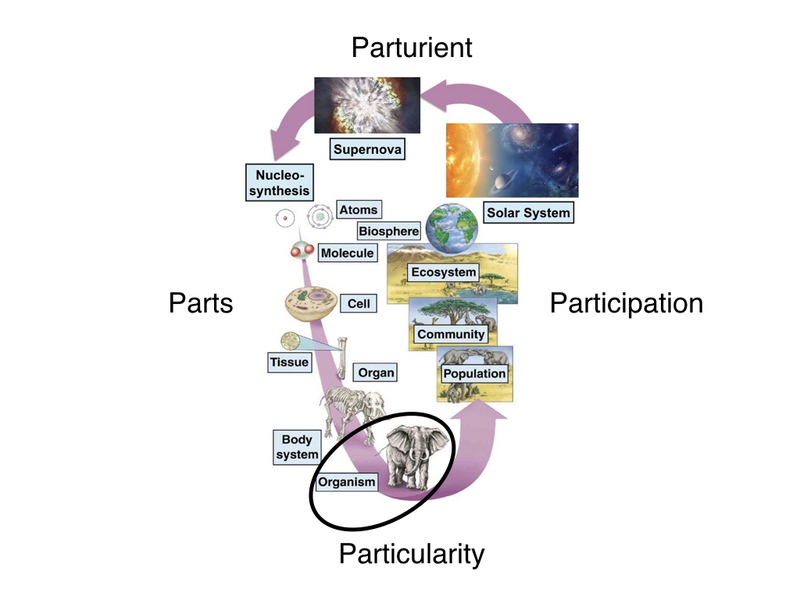 As a Particularity, we are made of internal Parts (cells, organs, systems, etc.) that Pull together to function on behalf of our body, the whole in which they reside. And, as a Particularity, we Push signals outwardly to Participate in greater wholes (families, species, communities, political parties, corporations, etc.). Below, we will use our Pragmatic Schematic (PS) and the language of Quadernity to explore Koestler’s ‘holons’. The Particularity includes BOTH Parts and Participation, so its label is found in the central area of overlap. The Particularity’s Parts are smaller and inside (left crescent), while the Particularity Participates in ever greater wholes outside and beyond (right crescent). Parts and Participation can be thought of as opposites, so they are labeled in the outer crescents, the positions of EITHER and OR. In the cosmic holarchy, shown as a loop below, an elephant exemplifies the Particularity. To its left are listed a small sampling of embedded Parts, and to the elephant’s right, in ascending order, are listed some of the greater wholes in which it Participates. Please realize that untold dimensions exist between the benchmark Parts that have been labeled; and the same goes for the greater wholes in which the Particularity Participates. Labels from the large loop above are shown stretched out across our Pragmatic Schematic below, sampling in the EITHER-OR crescents a few dimensions/scales pertaining to the integrated whole. A Particularity functions throughout internal and external domains, effectively BOTH differentiating and integrating them. A whole is more than it would, at first glance, appear to be. The elephant can neither be isolated from her Parts within, nor from her Participation with the environment beyond. Any selected organism/entity (centrally-located Particularity) extends full way across its spectrum of scales/dimensions. Parts are dependent on the Particularity, just as the Particularity is dependent on its environment. Particularities have self-centered interests and are prone to ignore the needs of Parts unless they express symptoms of discontent: hunger, dehydration, desire to replicate, etc. 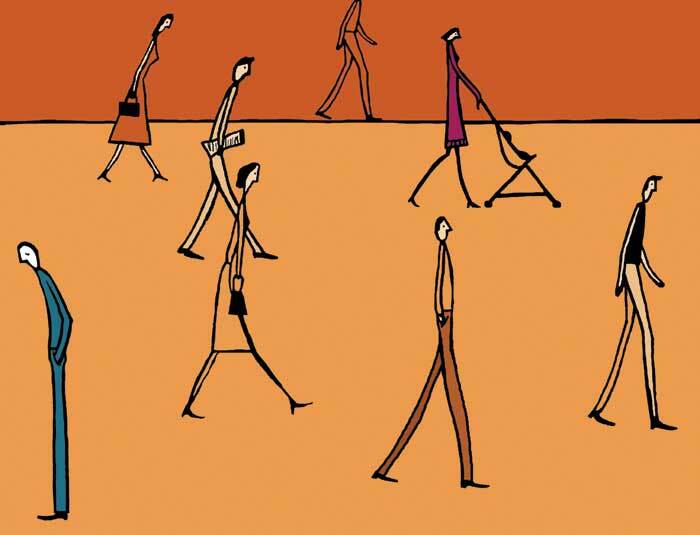 Participation, or involvement with something greater than oneself, most often remains unconscious, or instinctual, as well; however, it can become purposeful, as it does for some human Particularities. For better or worse, we are embedded in a family, in communities, in professional, political and religious organization(s) and, ultimately, in our planetary biosphere. It is up to us whether we Participate consciously and deliberately for the betterment of these important relationships. 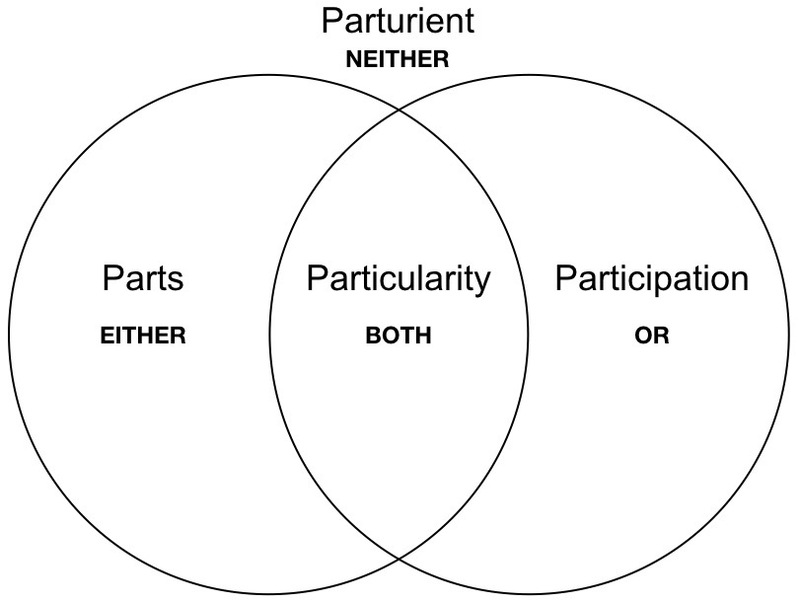 The word parturient is derived from the Latin word, parturire, meaning ‘the desire to bring forth or produce‘. While a mother labors to give birth to her offspring, both the Parturient and the baby are in a special in-between zone. The woman is between pregnancy and motherhood, and her offspring is between being a Part of the mother and being a Particular individual, him/herself. The Parturient metaphysical Matrix whence everything comes, and to which all ultimately returns, is the Mother who longs for Her Creatable Parts to become real-ized in Particular by an Informable Father. 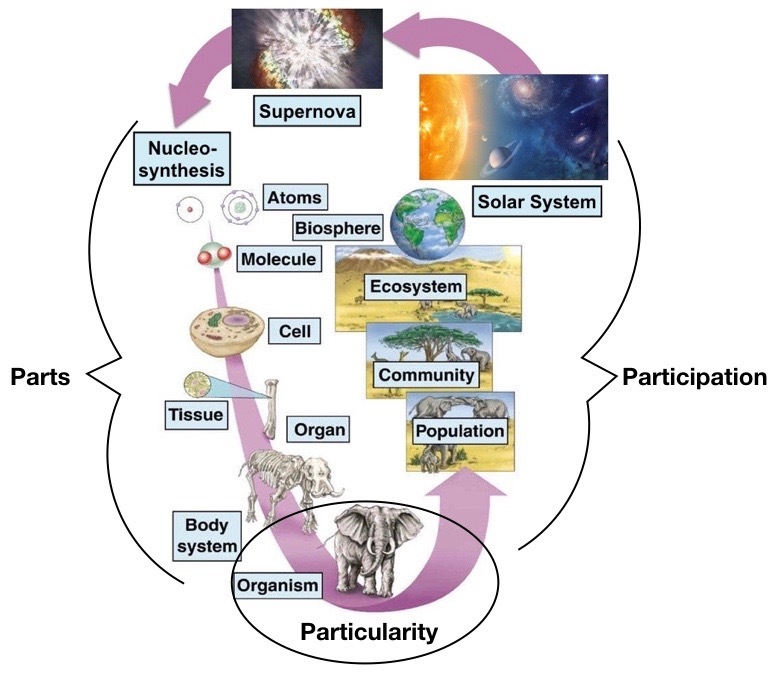 In the system depicted below, the supernova, a dying star, is labeled Parturient. In its implosion nucleosynthesis occurs, creating a cosmic recycling center. The greatest of wholes give back the smallest of parts. The purple-looped Holarchy above is reconfigured in the Pragmatic Schematic below. The transcendent space beyond the two encircled sets is labeled NEITHER, as it represents everything Not included in either of the sets. It is also Quadernity’s Parturient, that which transcends the Particularity, and is beyond even its smallest Part and its greatest Participation. We are not static beings; we are continuously in a process of becoming our conscious–corporeal selves. singled-out as Patterns of Matter. mingled-in, seeding the solution of pure potentiality. Beyond our physical body, beyond our emotionally-driven activities, and even beyond our mental capacity, is that which enables us to persist as a whole. Out in the metaphysical environment, beyond our persistent OUTformation, is the INformation from which we are re-sourced, or sourced again, in every moment. 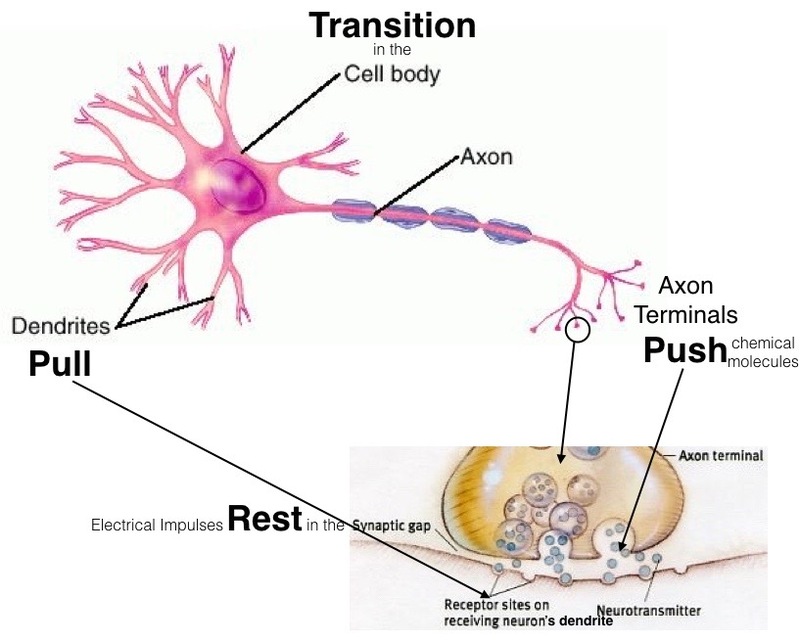 An example from biology offers a visual mapping of how linear transmissions, from the Pull of Parts (dendrite) to the Push of Participation (axon), are commuted by the Transitioning Particularity (cell body). Beyond and between the nerves (see enlargement), is the ‘synaptic gap’, a transcendent realm (Parturient) that allows for non-linear correspondence between Particularities. Electrical impulses move linearly within neurons. The impulse is born at the dendrite and dies at the axon. Between nerve cells, chemical transmitters communicate non-linearly; due to this, the propagation of signals throughout the nervous system is possible. Similarly, on a moment by moment basis, our experiences are appended in consciousness and our embodiment is refreshed. That which organizes the small Particularities, as Parts into a larger Particularity, is invisible and yet, without it the individuals would scatter, rather than cohere into a larger whole. When understood in light of Quadernity, the Parturient is responsible for the continued succession of every given Particularity. Quadernity’s Parturient is the non-linear source and sink by which our own life-spans are extended for their useful duration. The supernova is both the source of nucleons and the sink for the imploding star. The synapses are the source of an electrical impulse at the dendrite and the sink for the electrical impulse at the axon terminal. In the bardo, the collective consciousness seeds the ground state (Spirit of God moves upon the Waters). Our life potential exists within this bardo/gap; it is the source and the sink for our breaths, as well as for our incarnations. Always must they be two to go opposed ways from Me and back again to Me for reborning from the other one after finding rest in Me. The “Me” to which Russell refers is the ECP, or the immeasurable Tao, or the metaphysical Parturient Matrix, from which all things temporal emerge and back to which they return for Rest. Inter-dimensional correspondence is a non-local process. 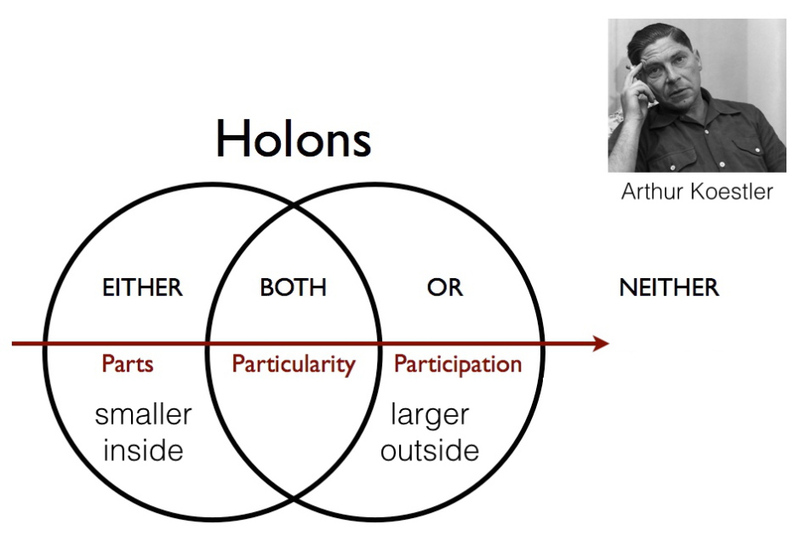 Inter-connected Participation occurs in a Space of another order, and yet, this hidden, other-worldly space is integral to the ‘holon’ and essential to its perpetuation. Entities endure in their present form for as long as their environments can effectively re-source them. We Particular (singled-out) humans are inextricably entangled (mingled in) with our environment (Parturient), which, for now, sufficiently supports us. We are in constant Participation (knowingly or unwittingly) with our biosphere, which, is perfectly resilient; however if we degrade the biosphere by deleterious behavior, the biosphere will at some point* respond in order to maintain its balance and heal from our disruption. This could mean we either learn our lesson or we get eliminated; it really is up to us. *All complex dynamical systems have parameters. Phase changes occur suddenly at critical junctures; just like water crystalizes at 32° (not a degree warmer) and vaporizes at 212° (not a degree cooler). 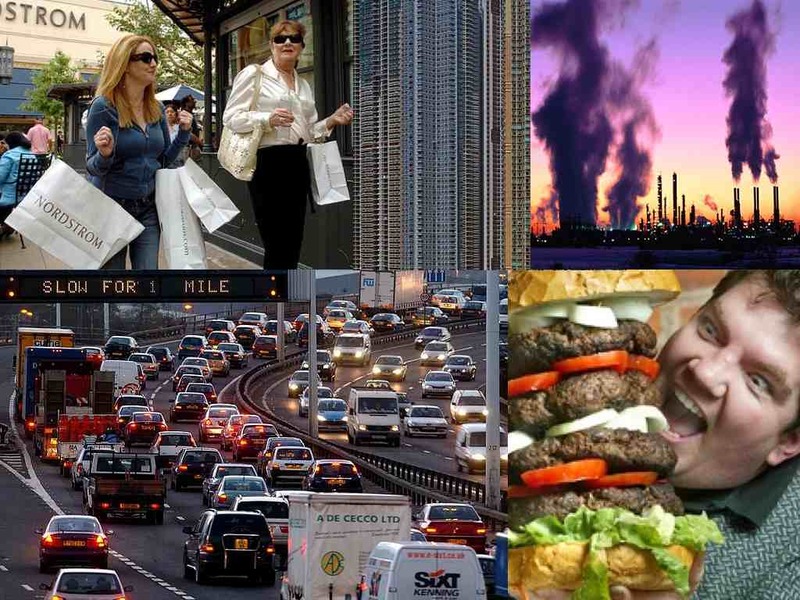 Deforestation, imbalance among species, climate change, the effects of fracking, and multiple forms of pollution are among the negative impacts contributing cumulatively toward systemic instability of our biosphere and a corrective adjustment. If we want to continue as singled-out Particularities, it behooves us to purposefully and positively Participate as mingled-in Parts of an intentional movement, geared to guard our ecological environment. Many really well-intended people operate from the notion that “to each his own”. What happens if one intends to remain private, exclusive, or protected from others? We are never alone. Nothing is ever alone, even if that which links us together is invisible. We can never withhold ourselves completely from the invisible and mysterious between-ness that facilitates beneficial coordination. Even when we are experiencing hermit-like isolation, we are still connected in some unknown way, through what is between us. We sub-consciously engage in feedback with that between-ness and this affects our personal and group behaviors. 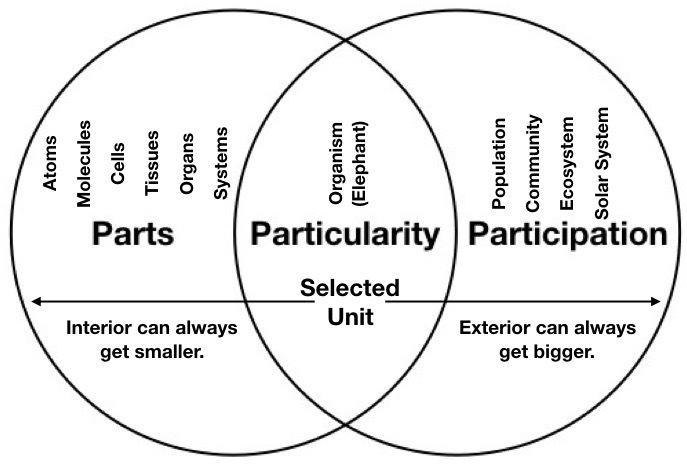 In a subordinate aside, Four Phrases for Four Phases, the Pragmatic Schematic represents conscious awareness at the human scale in four phrases — I Need, I Want, I Can, I Am — in alignment with four phases of developing coherence — Parts, Particularity, Participation and Parturient — which occur universally across all scales. If the doctor’s message is true, as everything in this post seems to indicate, then we would come to the conclusion that it is time to reconsider the impact that our habits and mind-sets have on society and humanity as a whole. We are living in very interesting times. Changes are occurring in the between-ness, of which we know so little. Let us inform ourselves about our inter-dimensional connectivity so that we understand our place in the harmonious whole. We BELONG, right here and now! It is our duty to discover how it is that we belong, how we care for our Parts, and how, as awakened Participants, we deliver our Particular gifts. When we practice habits of compassionate (w)holism, eventually assuming responsibility of the wise elder, we become the Parturient who perpetuates perfection. And when we follow our true path, our peacefulness, easefulness and usefulness feeds back to us, insuring the integrity and fulfillment of our functional fit. I agree wholeheartedly. We must now create a new paradigm for participation with nature and with each other. I believe zero point energy will be the energy system in that paradigm.